Stock photo of snow and ice formations near the bridge across the Fitzsimmons Creek between Whistler and Blackcomb Mountains during winter, Whistler, British Columbia, Canada. 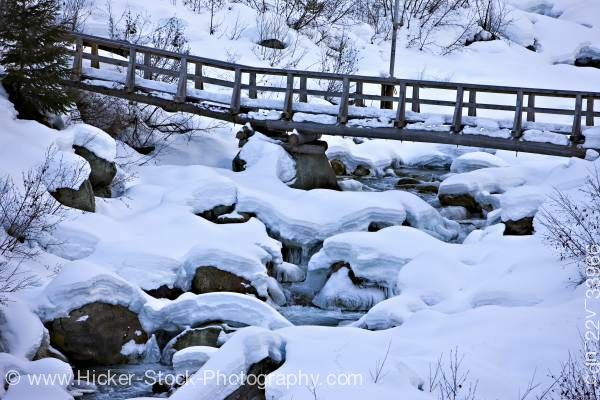 This stock photo includes snow and ice formations near the bridge across the Fitzsimmons Creek between Whistler and Blackcomb Mountains during winter, Whistler, British Columbia, Canada. Fitzsimmons Creek is a large creek having its origins at the Fitzsimmons Glacier in the Garibaldi Ranges of the Coast Mountains. For half its length of approximately 10 kilometres, the creek courses a u-shaped glacial valley which separates two ski mountains of the Whistler Blackcomb resort, Blackcomb to the north and Whistler to the south. Issuing onto the relative lowland of the Whistler Valley just adjacent to Whistler Village, the creek turns more northwest, flowing past the White Gold residential area and entering Green Lake just east of Mons. Fitzsimmons Creek is a very large and dynamic creek with a history of debris-laden flash floods in times of heavy weather, and is dyked with heavy rip-rap in its source through the area of the village.